I'm excited for some retro goodness out of O-Pee-Chee this morning. OPC blasters give you a nice amount of cards with interesting inserts, parallels, and subsets. The old cardboard feel of the cards is a welcome change from the modern style of most products out today. This should be an enjoyable break! Past O-Pee-Chee retail blasters can be found for heavily discounted prices. These blasters are not laden with hits or high value cards, so the market has adjusted accordingly. If you're not too concerned with finding autographs and jersey cards, OPC might be a good option as there are a lot of fun cards within the blaster boxes. I particularly like the sticker inserts that were found this year. The bright old school design really pops. This was a so-so break of O-Pee-Chee. I've definitely have had better boxes broken before. The blaster gave me what I expected in terms of non-base cards, but overall star power of the player selection was a little lacking. This shouldn't be much of a surprise though because of how large the OPC set is. Getting stars out of this huge collection is difficult. 12/13 OPC has been kinder to me in the past, so it probably was time to get a more disappointing box. Yep, that's right! When there isn't much in the blaster I go a bit off the rails with my choices! I chose the checklist because these types of cards aren't common in sets anymore. Back in the day I used to get a ball point pen and check off all the players I had on the list. Old checklists are some of the most valuable cards to find in good condition! Moore was not a Shark for very long, so you may be wondering why he's on my list. I chose this card because OPC includes players that are not hobby favorites. You'll find guys from all the lines on the hockey team. 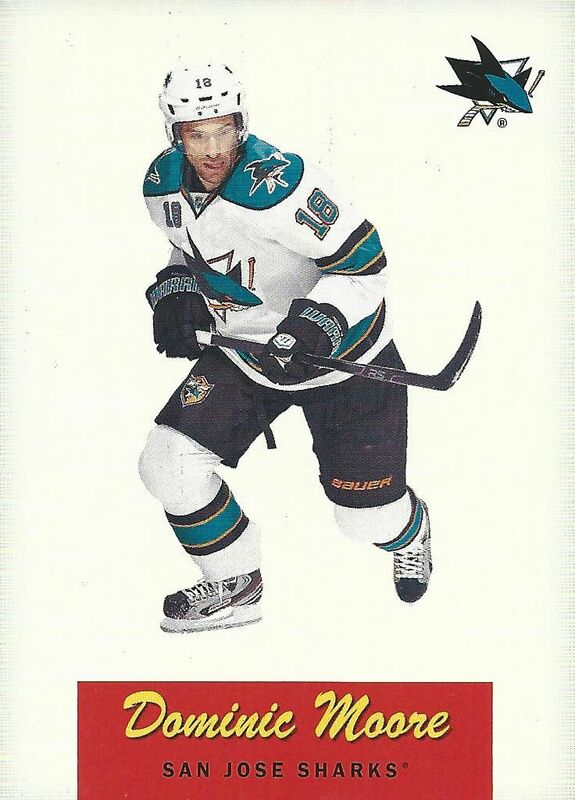 Moore hasn't had much cardboard so this card is actually a nice one to find for Sharks fans looking for more variety in their players. As I've stated before, I really enjoy the look of these sticker cards. 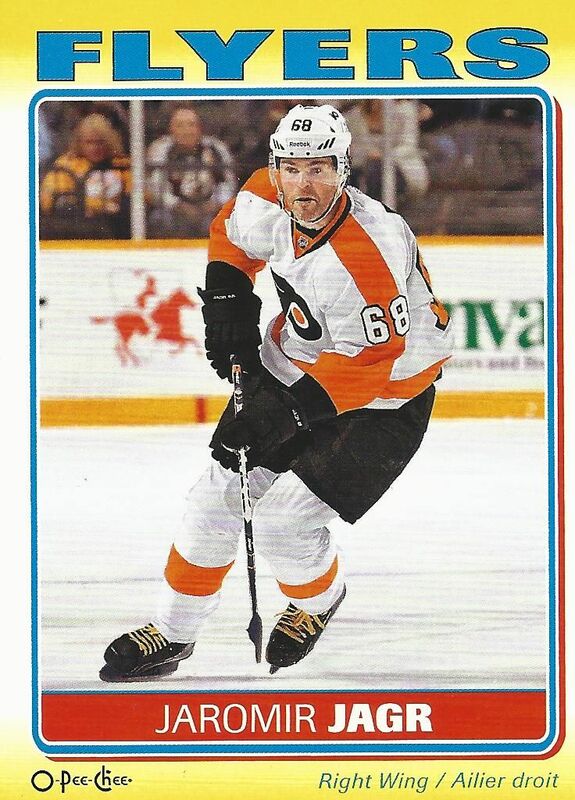 Jagr was one of the best players out of the blaster and him in a Flyers sweater is an interesting look. This particular blaster wasn't the best, but it still delivered what it was supposed to. You definitely win some and lose some - no matter what level of the hobby you are at. Opening up OPC is still a fun thing to do, and I'd recommend it to anyone looking for a budget break. Collectors coming back to the hobby from a long time ago may enjoy the look and feel of these cards. 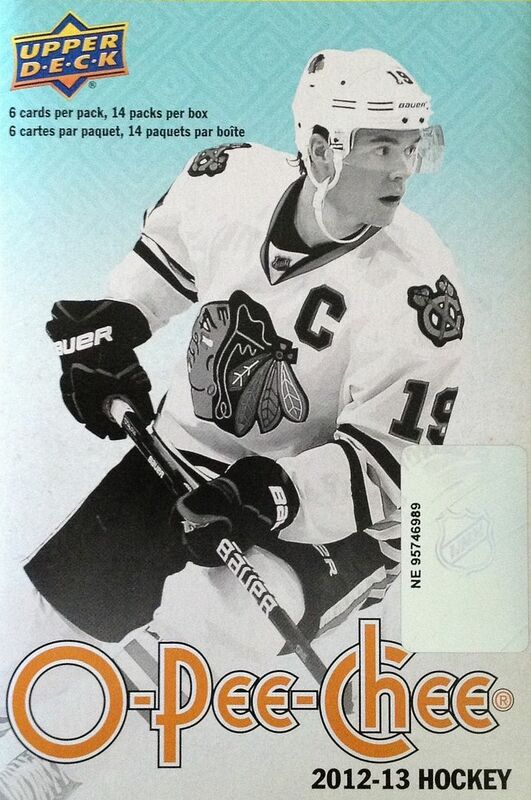 OPC is certainly a unique brand in today's modern hockey card world.